All pictures by the author, unless otherwise stated. The building in Heywood – within sight of the East Lancashire Railway’s (ELR) south-eastern terminus – was until 18 months ago the hub of a firm that produced supermarket shopping bags. Last year’s change in legislation that demands shoppers pay 5p for every bag saw demand plummet and sent the incumbent company into administration. 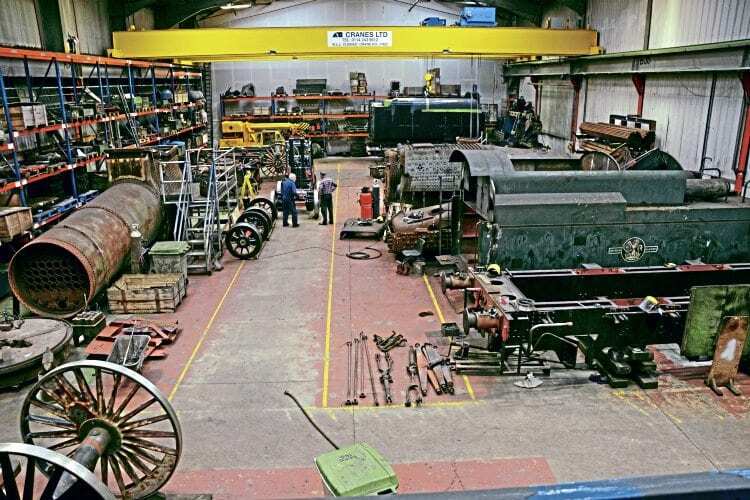 The beneficiary was Ian Riley’s engineering business, which had been put on notice by the ELR to vacate Bury Buckley Wells shed by January 2016. An agreement was reached to lease the building last September and, since December, lorry-loads of gear have been transported four miles east to the Heywood factory. The successful move is partly owed to a combined £80,000 grant from Rochdale Business Growth Fund and Rochdale Council. “It’s definitely an improvement in working conditions and it has an inherent facility for expansion,” Ian told The Railway Magazine during a first look round the new 26,000sq ft complex. A walk around this cavernous building immediately cements the mental impression that he still means business, 25 years after bursting onto the scene as Ian Riley Engineering. 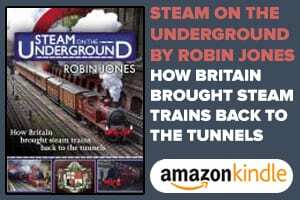 Indeed, this story of growth is emblematic of the emerging centres of excellence that are gradually prevailing as generations of steam locomotives become increasingly work-worn and difficult to repair by standalone preserved lines and organisations, whose workforces are becoming ever more stretched. “The whole industry is changing. There is less volunteer engineering help and people are now relying on contract help with more heavy engineering and overhauls put to tender,” Ian added. The Riley enterprise was previously packed into the western side of the original Lancashire & Yorkshire Railway carriage shed at Buckley Wells, divided by the so-called ‘Berlin Wall’ that kept the engineering business and the ELR activities separate. Anyone who is familiar with the Manchester area will know that wind, rain, sleet and snow is never far away, and it is therefore a relief to the two-dozen full-time staff ‘at the coal face’ that all work is now conducted in a dry, temperature-controlled environment, using gas heaters. That couldn’t be said for the original ‘dated Victorian facility’, which is now being finally redeveloped and brought up to standard in its own right for the sole benefit of the ELR’s engineering interests. Fittingly, the Riley relocation takes the business back to the original roots of the company, founded by his grandfather in the town, and where Ian started life as an apprentice 39 years ago. Visitors to the new Heywood workshops are greeted by a dedicated 1,722sq ft machine shop, complete with its own custom-built 10-ton cranes. This day-to-day commodity is already making the business significantly more efficient, because cumbersome items can be swiftly moved around the building, without minimal manual labour wastage. The works’ most impressive feature is the new pair of 17- and 32-ton travelling cranes, which boast the capacity to dismantle any locomotive component in the nearby boiler shop. Although the building was last used for producing plastic bags, it was originally built for heavy engineering some four decades ago, and was first home to Ames Crosta Babcock, a sewage and water treatment plant contractor. The new cranes procured by Riley’s use the original runners from that era. Meanwhile, state-of-the-art lighting floods the vast open spaces and there are dedicated messing facilities, offices and an organised storage area. The latter is laden with countless varieties of specialist tools amassed over two decades. What is immediately apparent is the lack of rails anywhere inside the steel-clad building, which to laymen would be considered a hindrance to the successful operation of a railway engineering business. Not Ian Riley. “The sheer open plan floor space makes it an ideal area for an erecting shop,” he argues, pointing to the rows of boilers and frames that are presented in an orderly fashion down one side; it is vaguely reminiscent of scenes from the original Swindon ‘A Shop’. Those minutes count when compared to operations at Bury, using rail-mounted cranes, which would take much longer. 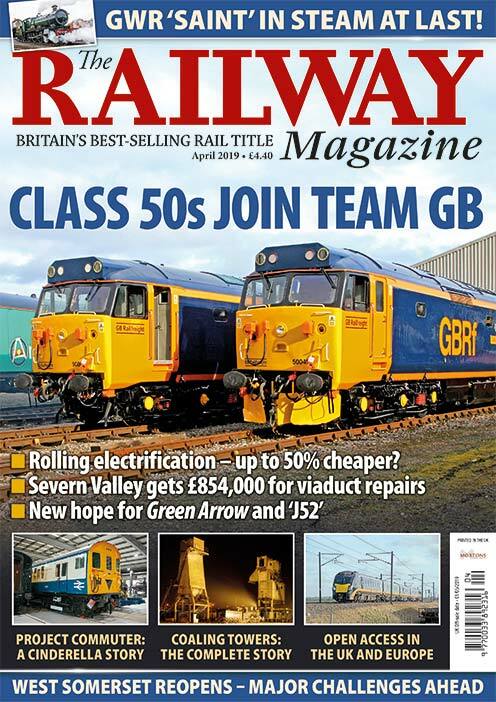 The ELR’s main line connection was certainly helpful to the operation of the in-house fleet, but Ian argues that it isn’t pivotal to the day-to-day business of Rileys as virtually all contract jobs arrive on lorries. On the day of our visit, this method of working was enacted. A part-built tender body was delivered into the works on a flatbed truck, lifted from the vehicle, and placed into the required position – all inside 20 minutes… and no rail wagon in sight. 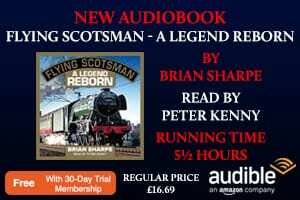 However, Ian does harbour an ambition to build an all-purpose running shed, complete with heavy lifting and stripping facility, for his locomotive and carriage collection (the latter comprises not only support coaches, but also 1928-built, LMS ‘Royal Scot’ rake Restaurant First Open No. 15412). He has scoped out a parcel of wasteland opposite the entrance to the works, which adjoins the East Lancs Railway, just west of Heywood station, for a 600ft-long x 300ft-wide building, plus storage sidings. He reckons that such a facility could be built by 2021. Evidence of his confidence in the new works was proven with the remarkably swift turnaround of his ‘Black Five’ No. 44871, which had its bogie comprehensively overhauled in Heywood, as well as other annual maintenance, while the locomotive itself was stabled in Bury. The engine was completed in time to play a significant role in the recent marathon ‘Great Britain IX’ railtour and is currently a regular fixture of the ‘Jacobites’. Machining the faces of the regulator for a North Yorkshire Moors Railway ‘Black Five’. The ownership of the ‘5MT’ with sister No. 45407, and having the operational responsibility for No. 45212 and Flying Scotsman, undoubtedly adds pressure on Ian and his team, but it is a continual challenge that he relishes. “Our business on the main line is something that enables people to see what we can do, and we get enquiries because of it,” he enthuses. That’s hard to disagree with, given the impeccable reliability that the engines from the Riley stable have consistently proven. Indeed, being out and about with the locomotives provides its own enjoyment. 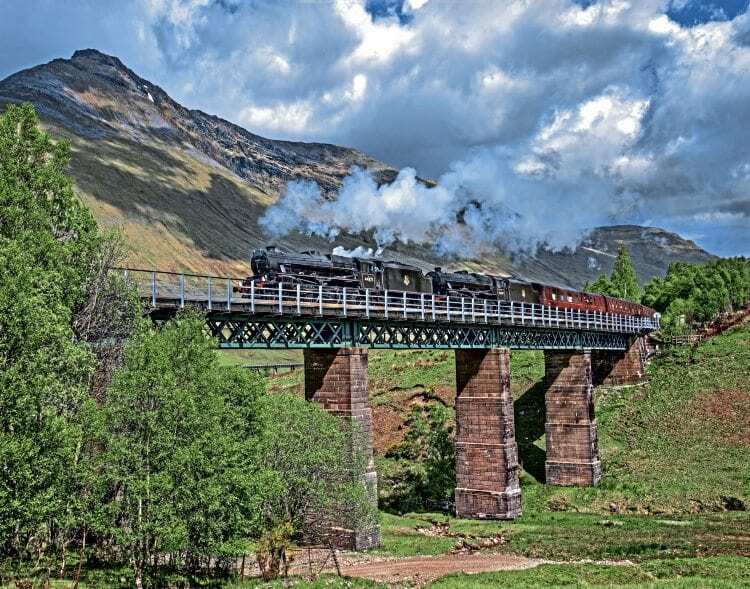 Ian is a fully certified driver for West Coast Railway Company and is regularly rostered to drive his own pair of ‘Black Fives’ on the irresistibly beautiful Fort William to Mallaig (‘Road to the Isles’) line in the West Highlands during his ‘busman’s holidays’. Engineering staff are also heavily involved; not only in providing mechanical expertise while the engines are on tour, but also as support crew and firemen. Ian has three of his own staff on West Coast’s firing books: Matthew Earnshaw, Andy Christie and Jack Johnson, all of whom are in their teens and twenties. Jack (18) became the charter TOC’s youngest footplate staff when he was passed out for firing in October 2015 under the guidance of Ian’s team. If the ‘Black Fives’ are the bread-and-butter of main line steam, then Flying Scotsman is the foie gras de canard. “60103 is an important part of our business and we have a good, healthy relationship with the museum,” says the man who was ultimately responsible for the successful conclusion of its £4.2million overhaul and (at least) the first two years of its operation. The stretched resource across the busy business meant that it was necessary for Ian to take on North Yorkshire Moors Railway engineer Clive Goult to be the ‘A3’s’ roving mechanical minder, assisted by former Grosmont apprentice Chris Williams, who was briefly in charge of ‘A4’ No. 60007 Sir Nigel Gresley. 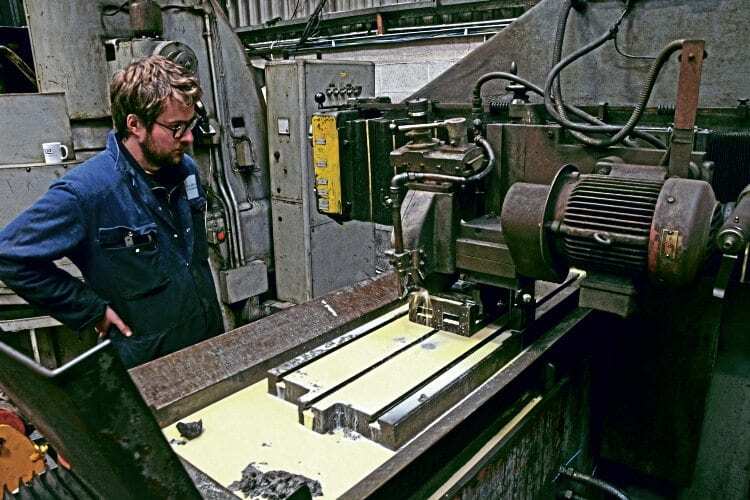 The core business employs more than 30 staff, ranging from apprentices to fully trained locomotive engineers, comprising fitters, coded welders, boilersmiths, tool makers, coppersmiths, sheet metal makers, and mechanical and boiler inspectors. 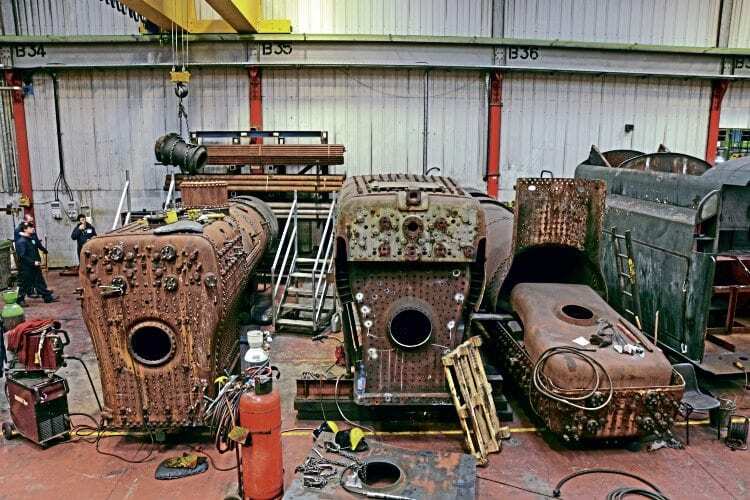 Heavy boiler work (from left to right): Standard ‘2MT’ No. 78022, ‘5MT’ No. 5025 and ‘4MT’ No. 80135. 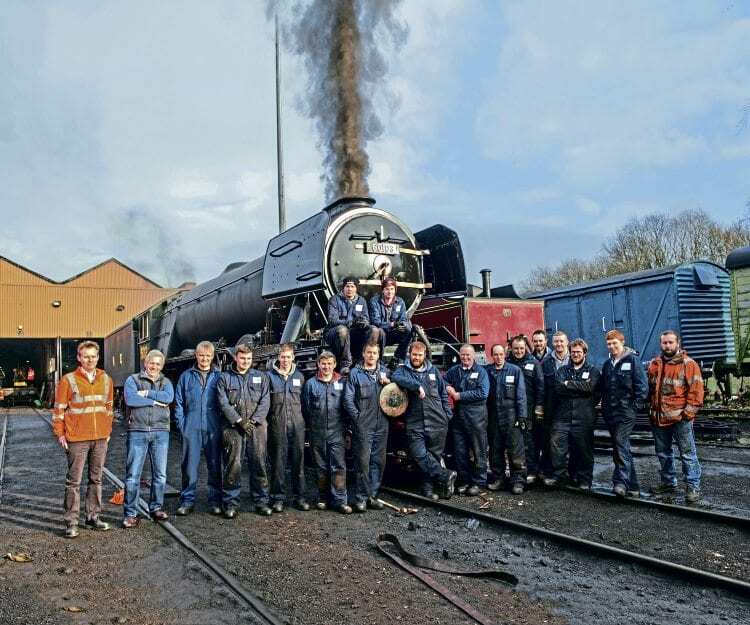 Two or three apprentices are drawn each year from the nearby Hopwood College, which again augurs well for the future of this Lancashire steam enterprise and heritage railway engineering in general. Ian points to all of the lathes being worked on around the works and remarks that all are being worked by apprentices (one of these machines is an impressive Stanko [Russia] 48in diameter, over 12ft lathe). ■ Tyre fitting, turning and Railway Industry Supplier Approval Scheme (RISAS) accredited manufacture, restoration and repair of railway axles and wheelsets. ■ Capacity to overhaul the smallest to the largest boilers. ■ Supply and fitting of air brake, Train Protection Warning System (TPWS) and On Train Monitoring Recording (OTMR) equipment. ■ White metalling, machining and fabrication. ■ Supply to the industry of specialist components, including firebox patch screws, washout and fusible plugs, side and crown stays. ■ Coded welding, pro-casting, forgings, forming steel plate, steel bar and copper tube welding. And there’s been plenty going on in the works to make best use of this equipment, as befits one of preservation’s biggest steam suppliers. ■ Overhaul of the boiler for ‘King’ No. 6024 King Edward I. Work includes a major reconstruction of its firebox. ■ Repairs to the tender tank originally from ‘Merchant Navy’ No. 35027 Port Line, but for future use with ‘West Country’ No. 34046 Braunton, to provide greater water and coal capacity. ■ Complete the construction of the new tender tank for Great Central Railway-based Standard ‘5MT’ No. 73156. ■ Overhaul of the bogie for John Cameron’s ‘A4’ No. 60009 Union of South Africa. 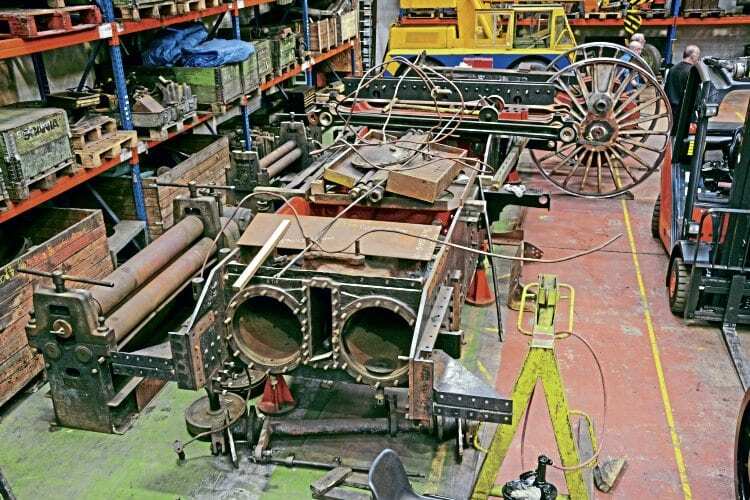 ■ Boiler overhaul for Watkinson Trust ‘Black Five’ No. 5025, comprising a new front tubeplate, front barrel section, outer wrapper side sheets, throat plate and door plate. ■ Repair of cracks in the wheels of ‘B1’ No. 61264 and re-tyring. ■ Overhaul of Standard ‘2MT’ No. 78022 boiler for the ‘Worth Valley’. ■ Construction of a new inner and outer firebox and full boiler overhaul for North Yorkshire Moors Standard ‘4MT’ No. 80136. As for his own engines, Ian recently completed another major repair to No. 45407, including the replacement of its right-hand cylinder, using a spare from broken-up ex-Barry Ten ‘8F’ No. 48158. In early July, work was completed on the overhaul of ‘Black Five’ No. 45212, which will be nominally based at the Keighley & Worth Valley Railway (KWVR). However, for the first time since 1968, the locomotive will be venturing onto the main line network again as part of a deal with the Brontë country line that will see Ian ‘adopt’ the ‘5MT’ for most of the time during the life of its newly certified boiler ticket. The locomotive was low-loaded to the KWVR on July 7 for final painting and running-in on passenger services. Once that has been completed, it will return to Riley’s Heywood factory for the fitting of air brakes, in a U-turn of the original intention to retain just its vacuum brakes. However, air will enable it greater main line flexibility, particularly as a third option for hauling the afternoon ‘Jacobite’ services, which use air-braked Mk2s. If you thought that main line yard pilots were the sole preserve of diesels, you’d be right, but not necessarily forever. The acquisition of ‘Jinty’ No. 47298 from Col Huw Parker has opened up a number of previously unchartered possibilities for the LMS ‘3F’ class, thanks to Ian’s ambition to fit the engine with full main line equipment. What a dismembered ‘Jinty’ tank looks like. This is the works’ pet project and, as the article reveals, it is being considered for main line running. Aside from hiring the ‘Jinty’ to heritage railways, Ian hopes to enjoy the wheeze of using the tank engine for hauling the empty stock for the ‘Jacobite’ between Fort William depot and the station each morning and afternoon. After 25 years in the railway business, what are the other ambitions for the company? The life of Riley! 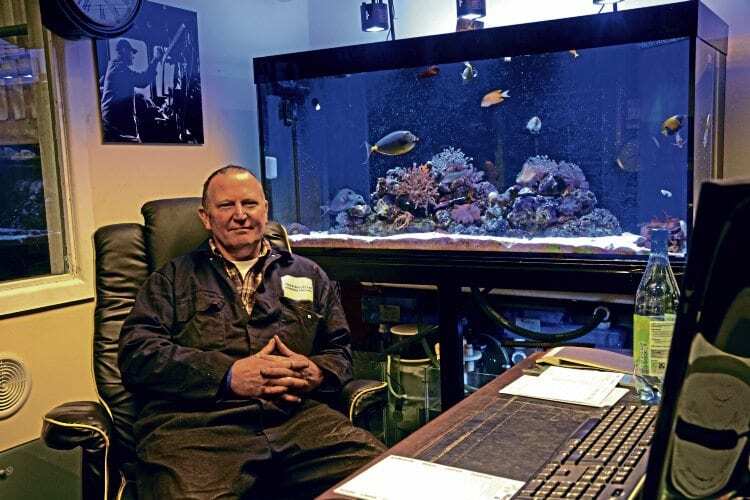 Proving that it’s not all about trains, Ian has a large number of salt water fish that help him relax during quieter moments, as well as two dogs – Weimaraner Sam and Cocker Spaniel Stanley. He also quietly mentions that he’d like “another two ‘Black Fives’ and the money to overhaul them”! One suspects that is more in hope than promise. ■ For any enquiries contact Riley & Son (E) Ltd, Premier Locomotive Works, Sefton St, Heywood, Lancashire, OL10 2JF. Tel: 0161 764 2892.